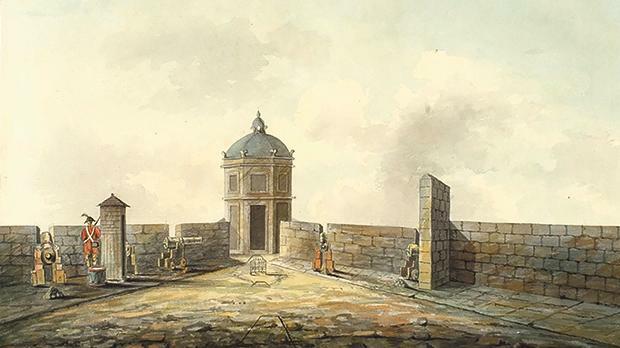 Sir Ralph Abercrombie’s Tomb at Malta, a watercolour by John Elliott Woolford. In the The Sunday Times of Malta of November 4, Christopher Grech published another highly informative and exquisitely written article titled ‘Sir Ralph Abercrombie: no peace in rest’. In the article he showed a steel engraving by William Henry Bartlett of Abercrombie’s tomb taken from Gleanings, Pictorial and Antiquarian on The Overland Route, published in London in 1851. There exists, however, a watercolour by John Elliott Woolford (1778-1866) who drew Sir Ralph Abercrombie’s tomb only a few days after his internment. The watercolour, which measures 257 x 373mm, shows a polygonal domed vault incorporated in the defence wall of the bastion of St John at Fort St Elmo. Given the short time needed to prepare the tomb for Abercrombie, it must have been decided that a vedette which stood at the point of St John’s bastion would be transformed into a mausoleum by walling up all its openings and perhaps adding finials at the corner of each side of the polygonal. The picture also shows a soldier standing guard next to a sentry box. In a panel underneath, there is written in pencil ‘Sir Ralph Abercrombie’s Tomb at Malta’. This watercolour is found in an ‘Egyptian Album’ compiled by George Ramsay, the 9th Earl of Dalhousie born on October 22, 1770 at Dalhousie Castle, Scotland. George Ramsay was a Lieutenant Colonel of the regiment, which accompanied the British expeditionary force to Egypt in 1800. With him was John Elliott Woolford (1778-1866), a landscape painter and architect, who also formed part of the regiment. General Abercrombie and Vice Admiral Keith, in charge of the expeditionary force to Egypt, called at Malta on board HMS Diadem and like Napoleon, lodged at Palazzo Parisio up to December 20. During their stay in Malta, George Ramsay commissioned John Woolford to make the first of several drawings intended for a souvenir album. From Malta, they proceeded to Marmorice Bay in Turkey to practise landing operations before they sailed to Egypt in a convoy of 150 ships. On their return to Scotland, after they left Egypt, George Ramsay and John Woolford stopped again in Malta and they took the opportunity to pay their respects to their late commander Sir Ralph Abercrombie who had been mortally wounded in the Battle of Alexandria which was fought on 21 March 1801, outside the walls of Alexandria near the ruins of Nicopolis. He died seven days later on March 28, 1801 and his body was taken to Malta for burial on board the frigate HMS Flora. The watercolour was made to commemorate the occasion of their visit to Abercrombie’s tomb. The album in which it is found is the first and only pictorial record of the British Expeditionary Force to Egypt in 1800, in which Napoleon was defeated by Nelson and the British Army. The aim of this expedition was to remove the French Army which had gone to Egypt in 1798 under Napoleon as Commander in Chief of the Army of the Orient. An article about the whole album is being written.